Summary: The National Writing Project’s New-Teacher Initiative supported local writing project sites in expanding their work with early career teachers, placing a particular emphasis on the teaching and learning of writing in high-needs schools. A useful resource for leaders of professional development experiences for early career teachers, this annotated bibliography is a partial listing of the readings that have been most significant in the work of the New-Teacher Initiative. They address four areas: 1) the teaching of writing, 2) understanding culture and its implications for teaching and learning, 3) strengthening inquiry as a mode of learning, and 4) rethinking professional development for new teachers through participation in a professional community. From the collective experiences of the national and local NTI teams, three major areas surfaced that needed support through the learning opportunities offered to NTI site leaders. These were 1) investigating strong models of meaningful, high-quality professional development for new teachers, 2) making inquiry a part of the way sites work with new teachers, and 3) deepening site leadership’s own knowledge about the teaching of writing in order to help their newest colleagues. 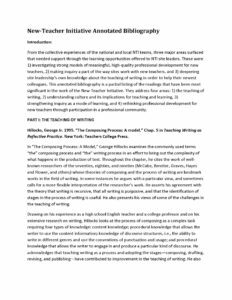 This annotated bibliography is a partial listing of the readings that have been most significant in the work of the New-Teacher Initiative. They address four areas: 1) the teaching of writing, 2) understanding culture and its implications for teaching and learning, 3) strengthening inquiry as a mode of learning, and 4) rethinking professional development for new teachers through participation in a professional community.